Founder and former chief executive officer of Lynch Syndrome International, inspirational author, and criminal investigator Lindy Bruzzone has announced the debut of her memoir, My Father’s Daughter: A Story of Survival, Life, and Lynch Syndrome Hereditary Cancers. The book was released in honor of Lynch Syndrome Hereditary Cancer Awareness Day on March 22, 2016. Plans to promote her book include Bruzzone presenting the opening speech for the annual conference for the European organization, Lynch Syndrome U.K., scheduled in Bristol, England, on May 7, 2016. As a child, Lindy Bruzzone knew how she would most likely die. It would be like everyone else in her family who had passed away from cancer—her father, his father and his mother and most of those in between. For them, it was how life ended. In My Father’s Daughter, she tells the story of her ancestors confronting challenges beginning in the early 1600s when they crossed the ocean seeking freedom. They fought for survival as they migrated westward and settled in Los Angeles County in the 1890s. It was there, following World War I, when members of her grandfather’s family died, one by one, of hereditary cancer during a particularly ugly time in America, during the eugenics movement. She offers fond childhood memories of growing up within the security of small town, Carson City, Nevada, where her parents live humbly and teach their children to care for themselves in the event cancer strikes again. Lindy challenges mortality—first as a teen, then as a single mother working within California prison yards of Soledad and San Quentin, and supervising the most violent parolees on California’s mean streets of Oakland and Richmond. She works as an investigative consultant as cancer hits members of her family and she awaits her turn for cancer to strike. My Father’s Daughter discusses the day she was diagnosed with late staged cancer. Instead of the ending of a life, a new beginning occurs. Bruzzone undertakes a genetic journey working with an outstanding medical team to understand and live with the hereditary cancer condition of Lynch syndrome. A roadmap for survival through life, this memoir inspires strength and gratitude in seeing how Bruzzone learns how to live as her father’s daughter. 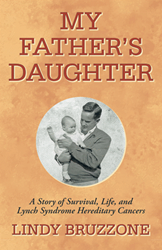 My Father’s Daughter: A Story of Survival Through Life and the Hereditary Cancers of Lynch Syndrome is now available for order through I-universe Publishing Company. It is expected to be available for e-reading through Kindle by the end of March. To learn more about Lynch syndrome, please visit Lynch Syndrome International online. Lindy Bruzzone is available for interviews and appearances. For booking presentations, media appearances, interviews, and/or book-signings, contact lindaleebruzzone(at)gmail(dot)com.